The following entry is part of the 4 city tour from our 2016 Eastern European trip which included Krakow, Prague, Vienna and Budapest. Enjoy! Rooftop Food & Drinks at Das Do & Co Restaurant - After our short 2 hour train ride from Prague to Vienna and checking into our AirBnb, we headed towards St. Stephen's Cathedral which is said to be the city center of Vienna. There we found our way to the top of Do & Co Hotel for some food and drink. The view overlooked the Cathedral and the surrounding square which was exceptional. Patio Hopping along the Hofburg Palace - After lunch on the rooftop we ventured further into the city and toured the MANY gardens and exteriors which are home and workplace of the President of Austria. Along the way we found a few patios where we stopped to enjoy the view, rest our feet and grab drinks. Schönbrunn Palace - This 'house' and it's extremely large gardens were once the imperial summer home to the royal family. 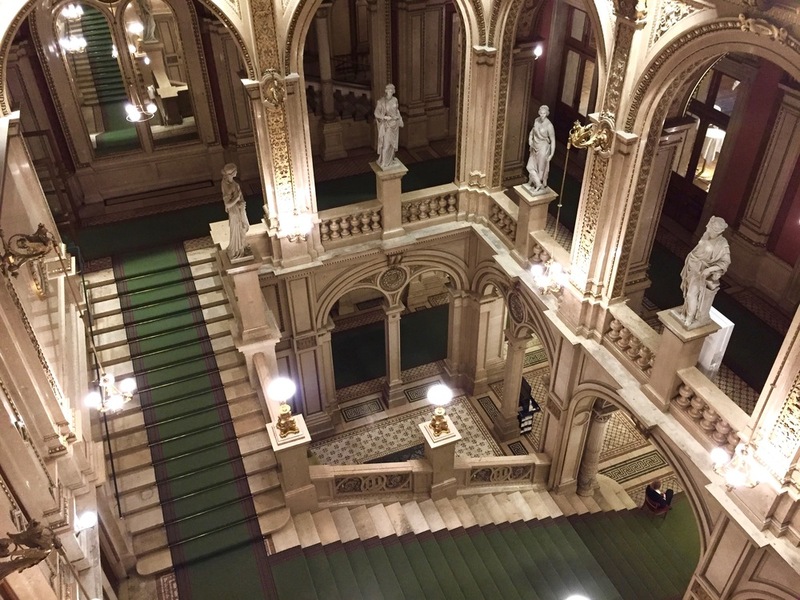 We took an audio guided tour inside the palace which was incredible - each room was set as it would have been during the time it was occupied by the Habsburg family; it allowed for us to really picture how the family lived. Our 1 hour tour didn't even make a dent in the 1,441 room layout inside the palace. After, we toured the gardens including the privy gardens which was very picturesque especially from the raised platform where we took a couple photos. The Wurstelprater Amusement Park - That evening we ventured towards Vienna's second district where we (and I'm not exaggerating) laughed our butts off. We headed straight for the giant Dutch Swing and went up skyscraper high for about a 5 minute ride. It was a night view of the city only to be upstaged by the famous Wiener Riesenrad Ferris Wheel, which we rode after we grabbed a few drinks at the pub inside the park. It was a super fun experience and highly recommended if you ever get the chance! Shopping & Apple Strudel - The next day we got our shopping on along the many store fronts located along the busy main drag in the center of the city. Emily shopped for Vienna trinkets, I hunted for authentic apple strudel and the guys found a patio and made friends with the waitress who kept them hydrated while they waited. All parties were successful! The apple strudel was tasty, but the Trdelnik we enjoyed in Prague was better! 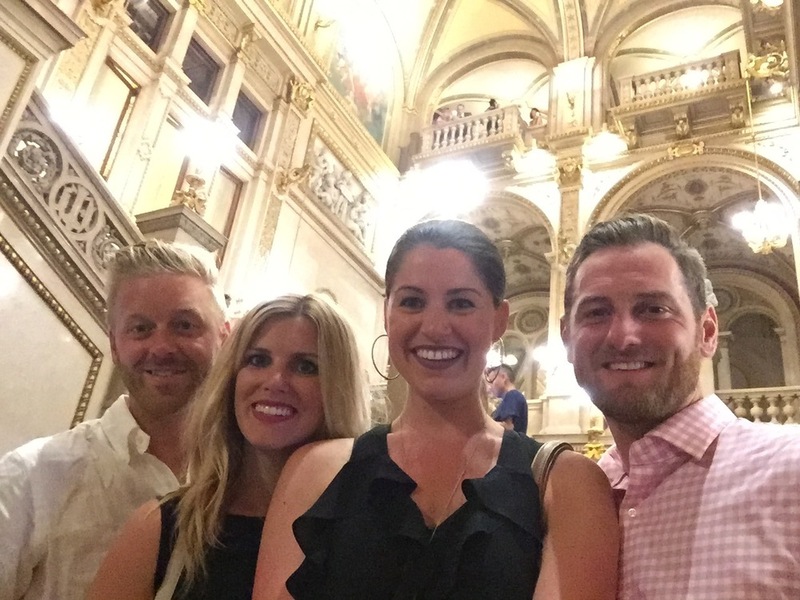 Vienna State Opera - Vienna is known as the City of Music and is something we thoroughly enjoyed at the State Opera House the second evening we were in town. The house itself is a site to see with it's gorgeous interior both in the lobby and inside the theatre. While we couldn't understand one word of what they were singing, it was a unique experience we could not have seen anywhere else. Plus, it was and excuse for us to get fancy. 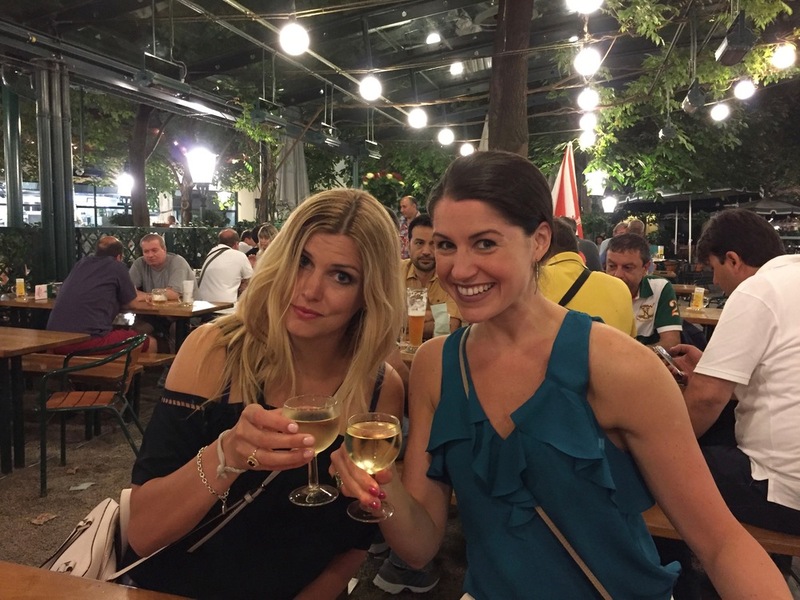 Drinks Along the Danube Channel - After visiting the opera and a late dinner, we made our way to the river front where the night life was in full swing. As far as the eye could see there were shipping containers standing as bars. Every table was full as people enjoyed the warm night air, ordered drinks, and sat along the rushing water below. The atmosphere was full of energy and a great place to enjoy good friends and conversation late into the night. Next (and final) stop: Budapest, Hungary.